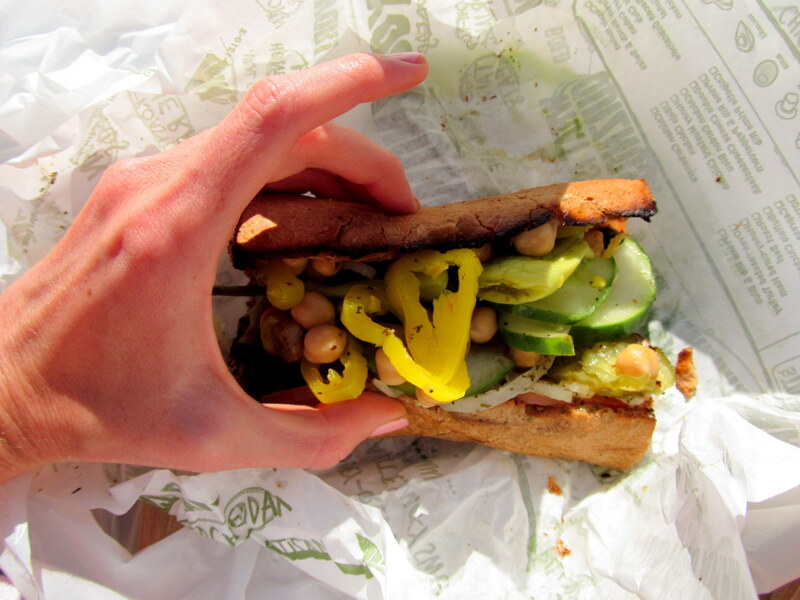 My very favorite sandwich chain is not your usual go-to, Subway. It’s Quizno’s, which so happens to have had almost every location in CT closed – LAME. The company has fallen on some hard times, but I hope they survive because I think they offer the best ingredients, no question about it. The only thing Subway beats them on is the bread, but the contents of the sandwich (including pickles – and Quizno’s has them on their condiment bar!) are more important to me. It’s one of those chains that I always make a point to visit when I am near one. Though FL locations have been forced to close too, the phenomenon is not nearly as widespread as it is around here, and I always visit the Quizno’s near my grandma’s apartment whenever we take our family trips to Florida, as we did last month. Enough rambling, let me show you the fantastic small veggie sub on wheat that I had for lunch one day by the pool on our trip! 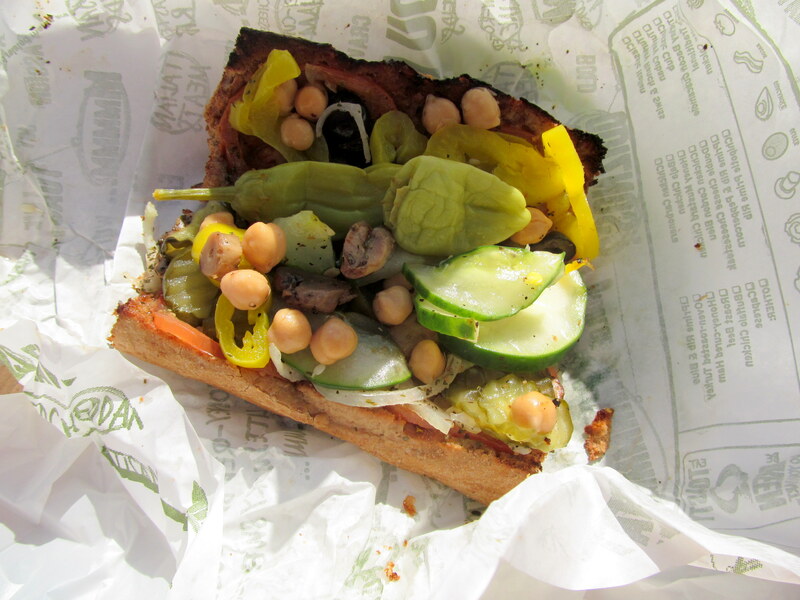 Completely stuffed with banana peppers, pickles, cucumbers, pepperoncini, chickpeas, tomato, onions, and mushrooms. No iceberg lettuce shreds for me – those 95% water things always make more of a mess and do nothing more! As you can imagine, I made quite a mess while eating this and ended up using a fork to finish a lot of the fillings that fell out. But it was the best Quizno’s sub I’d ever had – and I got to have another one for my last meal of the trip, on the airplane ride home, since our layover airport had a location too! Another thing I did a lot of in Florida (though this one I can do back home) is shopping. I had the perfect amount of shopping luck – enough to get a few fun things (mostly with holiday gift cards) but not so much that I felt forlorn as I left desired purchases behind for the sake of saving my money (yeah yeah, first world problems, I know). The day after Christmas, my fave fashion blogger J was live-tweeting all the amazing sales going on, which sparked my urge to use some of those gift cards ASAP! My favorite purchase of the day was also my first – a new Nordstrom’s purse. Usually I don’t buy anything from this store because I’m too cheap, but it was super affordable and not even at a sale price! It’s slightly larger than my last purse (a Coach from a secondhand shop) so I already feel like I have SO much extra room in it. I love using it so far! I did make a food-based purchase at the mall as well. I got hungry for a shopping snack! My Starbucks gift card came in handy here! I used my Forever 21 gift card to buy a blazer that is a bit more daring than something I’d normally buy, but I knew just the pants I can wear with it, and I “debuted” the outfit at work yesterday. Success! I went with a plain black T underneath the blazer. Bath & Body Works continued to lure me into buying mass amounts of things I don’t need. They were having one of those “Hello Yellow!” sales in which they hang giant posters of rubber ducks in the store windows and proclaim that everything is “99% off “or “buy 1 get a zillion free”! These are exaggerations, but the signs’ proclamations might as well have said those phrases, judging by the way I made a beeline for the store and started scooping up seasonal candles and soaps that were marked-down to post-holiday prices. Got this little candle, and one other flavor that I can't recall at this time. Totally don't mind if my hands end up smelling like peppermint in June. Come springtime, my hands will smell of freshly picked…gingerbread men? At least I can spread the holiday cheer all year round, right? Monthly purchase of things I don’t need from Bath and Body Works…check. Do you have the same tendency as me when it comes to Bath and Body Works (buying things you don’t need at all)?